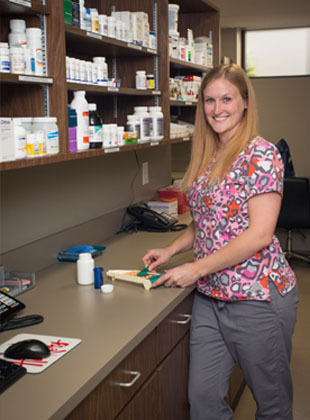 As the prescribing veterinarian for your pet's medications, we are able to ensure there is a direct link between the exam room and our pharmacy. This means your pet will receive the right medication, at the right dose, in the right form as quickly as possible. We will also be able to easily guide you on the medication's use as well as monitor its effectiveness. You can also feel confident all the medications we dispense were obtained from safe, reliable sources and stored under the right conditions. We maintain a complete inventory of veterinary pharmaceuticals, vitamins, shampoos, flea and tick control products and heartworm preventatives to meet the needs of your pet. We also carry a full line of prescription diets. If your pet requires a prescription diet we do not carry, we can easily order it for you. A lost pet is a frightening situation with often devastating consequences. Studies have shown more than 10 million pets get lost each year and approximately 90% of those found would not have been returned to their owners without some form of permanent lost pet identification. This is why the team at Omaha Animal Hospital considers microchip pet IDs a fundamental way to protect your pet and an important part of responsible pet ownership. Each microchip registers the animal with a unique identification number, which is filed in a database with your contact information. The contact information can be updated anytime, and it is important to remember to do so whenever your information changes. If your pet is lost, the microchip can be scanned by animal control officers, at shelters, and at veterinary hospitals in the U.S. and in many foreign countries as well. Dr. Berglund’s dog Frank has shown us the importance of pet microchipping first hand. When Frank scampered out without his invisible fence collar, he was found in a nearby park where he was taken to a nearby facility where he was scanned. Dr. Berglund was notified and the family was reunited in a few short hours. For many pet owners, even thinking about their pet’s final days is difficult and emotional. Our animals are a part of our family. It is this strong bond, born from years of loyal companionship, that makes this time particularly hard to bear. All of us at Omaha Animal Hospital will do our best to help you prepare for these important issues with the compassion and sensitivity they require. We offer at-home euthanasia on a case-by-case basis.